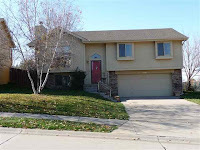 Angela May's Omaha Nebraska Real Estate Blog: Price Reduction! Great home loaded with updates! New roof in Aug '08, updated flooring thru-out home with new Friese carpet on Lower Level '08, newer hot water heater '06, heat pump '04. Nice sized Kitchen including extended countertop for barstools & planning desk. ALL Kitchen appliances stay - including the newer dishwasher! Other features include; designer light fixtures, vaulted ceilings, new skylight, plant shelves, Fireplace, French doors to deck, nice sized Laundry Room with convenient folding counter & cabinets. Large Backyard which is flat, fully fenced and has many mature trees, a deck & more. Please visit www.HuskerHomeFinders.com or contact Angela May directly @ 402/709-4908 for more information or to schedule a private showing of this great home.